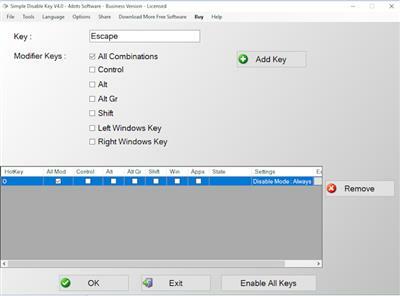 Simple Disable Key allows you to disable or remove specific key functions/combinations from your keyboard.This utility will provide a solution for those times when a keyboard key is not functioning properly or for when you are playing a game and continuously hit a particular key in error. You can just disable it and continue on with your activities. Simple Disable Key permits you to select when the key or combo is to be deactivated and you have the choice to set it up for specific apps only, to run at startup, or on a schedule if you prefer. You can also temporarily allow full key function via the systray icon.